We’re announcing the second edition of the MEC Poker Open. This edition will be held 4-7 april in Spa. 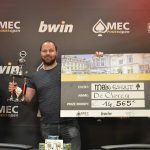 The first edition of the MEC Poker Open (October 2018) was a huge succes. The Main Event attracted almost 600 entries which is huge for a new event with only 2 starting days and all side events were almost sold out! 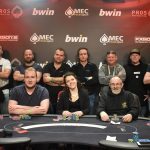 The second edition of the MEC Poker Open will be a bigger event with a €175,- Main Event, a €440,- Highroller and several side events. The second edition have some big changes. The main-event is now 4 days long instead of the previous 3 days. So expect a bigger pricepool! That also means that you can enter the tournament on Thursday, Friday and Saturday. Day 2 will be held at Sunday. 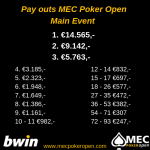 The buy-in for the main-event is €175,- and there are several side-events during The MEC Poker Open. Fancy a tournament with a higher buy-in? No problem! We’re introducing the High-Roller with a buy-in of €440,-. Besides the high-roller there are several tournaments under the €100,- including a new unlimited re-entry tournament of €35,- . The sale starts at monday 20:00! Last year there were more than 580 players registered in the main-event. This time we expect even more players. Blind structure | Join the community! There’re some changes regarding the blind structure. The starting stack remains the same 25.000, but the first level is 25 / 50 instead of the previous 50 / 100. The late registration ends at level 7. Last year this meant the blinds were 300 / 600, but this edition it will be 200 / 400 and the day ends with 1.500 / 3.000. This means a better structure for the players and more room for some nice moves at day 1. But… we’re thinking of something new. Mathijs Jonkers says:” Last year the structure of day 1 ended with the blinds 2.000 / 4.000. We noticed that at the end of day 1 players were very close of entering the money. Because the main-event contains multiple days, this was something we didn’t want and expected. That’s why we decided to play level 2.000 / 4.000 at day 2 instead of being the last level of day 1. When talking about it with Evert-Jan van IJzendoorn, we came up with a new idea. Instead of the 15% rule for players to finishing in the money, we say that if you proceed to day 2, you’re guaranteed a place in the money! We think it will be nice for all the players that if they make day 2, they’re guarenteed of finishing in the money. If we proceed with this idea, the level 2.000 / 4.000 will take place at day 1 and possibly level 2.500 / 5.000 also. We expect that around 15% of the players will make the money, but the idea of making it to day 2 and making it to the money is something players will love. It also means that there is more room at day 2. You can already reserve your stay at the hotels that we’ve available during the weekend. Including a new hotel with more comfort. Our new partner is Silva Hotel Spa Balmoral. This hotel is a very nice 4 star hotel with a spa and pool which will be free to visit during your visit. The Hotel is only 5 minuts from the Casino (during the MEC Poker Open we have a shuttle service as well). You can easily book your stay through WhatsApp. Click here for more information.